Business and human rights has emerged as a distinct field within the corporate governance movement. The endorsement by the United Nations Human Rights Council of a new set of Guiding Principles for Business and Human Rights in 2011 reinforces the State’s duty to protect against human rights abuses by third parties, including business; the corporate responsibility to respect human rights; and greater access by victims to effective remedy, both judicial and non-judicial. This book draws on the UN Guiding Principles and recent national plans of action, to provide an overview of relevant developments within the ASEAN region. Bridging theory and practice, the editors have positioned this book at the intersection of human rights risk and its regulation. Chapter authors discuss the implications of key case-studies undertaken across the region and various sectors, with a particular focus on extractive industries, the environment, and infrastructure projects. Topics covered include: due diligence and the role of audits; businesses’ responsibilities to women and children; and the mitigation of human rights risks in the region's emerging markets. 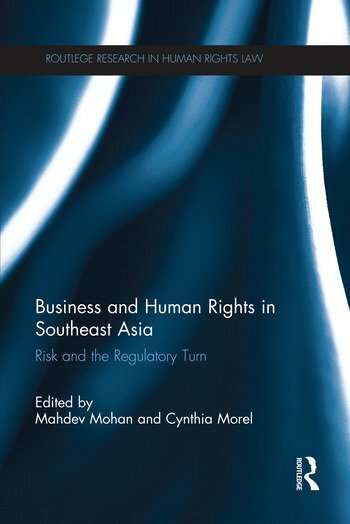 The book sheds light on how stakeholders currently approach business and human rights, and explores how the role of ASEAN States, and that of the institution itself, may be strengthened. In doing so, the book identifies critical challenges and opportunities that lie ahead for the region in relation to business and human rights. This book will be of excellent use and interest to scholars, practitioners and students of human rights, business and company law, international law, and corporate governance. Mahdev Mohan is Assistant Professor of law and directs the Asian Business & Rule of Law initiative at the Singapore Management University. A former Fulbright scholar, Mahdev's research and writing in the fields of international law and conflict resolution have been awarded Stanford University's Carl Mason Franklin Jr. Prize for International Law and the Richard S. Goldsmith Research Grant for International Conflict and Negotiation. He has a background in commercial & international dispute resolution, and is an Associate Member of Temple Garden Chambers’ public international law practice. He is also the Executive Director of the Society of International Law (Singapore). Mahdev is the editor of the Journal of East Asia and International Law and writes on international law, investment arbitration and human rights in Asia. Mahdev represents genocide victims before the UN-backed Khmer Rouge Tribunal. He is a member of the Africa/Asia coalition that has been commissioned by the United Nations Working Group on Business & Human Rights to assist with crafting a structured template for use by business, government and civil society. Cynthia Morel has been an adviser to the Asian Business & Rule of Law initiative at the Singapore Management University since 2011. In that capacity, she has contributed to submissions to various bodies, including the UN Working Group on Human Rights and Transnational Corporations. She additionally helped conceptualize and coordinate SMU’s first Summer Institute on Business and Human Rights in 2012; an initiative which informed this publication. Morel has concurrently served as a consultant to ASEAN-based and international NGOs on matters relating to large-scale land acquisitions; community stakeholder engagement; and advocacy strategies for rights-based development. Prior to moving to Asia, Morel established Minority Rights Group International’s strategic litigation programme in 2002. In her capacity as founding legal officer, and later as senior legal advisor, she spearheaded landmark cases before the European Court of Human Rights and the African Commission on Human and Peoples’ Rights. She has also litigated on behalf of the Open Society Justice Initiative.